Let’s face it- today’s job market is tough. The credentials that would fetch a top-tier position a decade ago are now only delivering an entry-level one. Unemployment and unpaid internships abound, and there is a distinct trend that is emerging from this new market milieu. Those with the most well rounded resumes are the ones getting hired and promoted. The ambitious and creative few who take the time to flesh out their skill set and tack on certifications are the ones who bring the most usability to the job market. Utilitarianism has taken over, and employers are looking to stretch their new hires over several different professional fields. In this new minimalist market, if you can offer the skills and expertise of three people rolled into one, you’re miles ahead of the pack. The digital era is nothing new, but accomplishing design and marketing in-house is still relatively fresh. Many companies and startups are starting to make their own logos, brochures, websites, and other materials, utilizing their own limited staff. So if you are looking to get a leg up on the competition, or put your hat in the ring for a promotion, basic graphic design skills are pure gold on your resume. You don’t need any particular art background or drawing talent to become proficient in Adobe Illustrator, and it makes the ideal addition to any CV from any field- finance, education, nonprofit, tech…everyone benefits from savvy and sharp design. Adobe Illustrator classes are waiting for you to enroll, so here are just five great reasons why you should sign up today! It’s amazing how one simple image can speak for an entire brand, provoking recognition and market power with just a small mix of colors and shapes. But the influence of logos is more and more appreciated, and more businesses are choosing to co-create their branding with their own staff to better reflect their ideas and values. 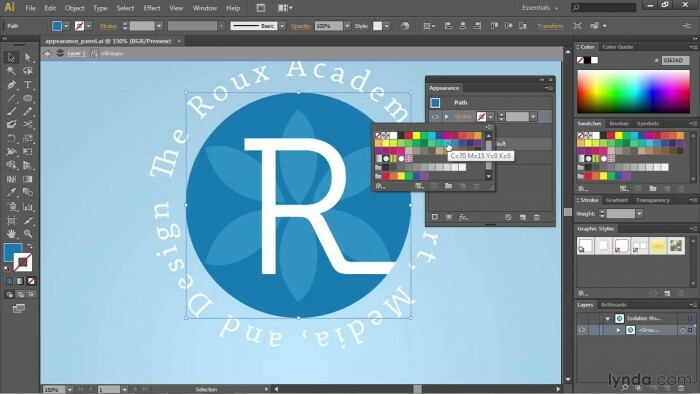 Logos are one of the easiest things to create using Illustrator, and there is a huge demand for logo design in the market today. If you can show you have the know-how for this, you are bound to be more attractive to a potential employer or promotion manager. The general public is being more accustomed to having information fed to them in sharp, eye-catching graphic ways. Text doesn’t hold the power it used to, and more designers are funneling their facts and figures into colorful displays that are easy to digest and also easy to share via social media. Creating mathematically accurate and stunning charts and graphs is a staple of the Illustrator repertoire, and can boost your appeal especially in the education, nonprofit, and finance sectors. The demand on the market now for unique and handmade illustration graphics is at an all-time high. Everyone is looking to create their own individual look on everything from business websites to kids’ birthday party invitations. Adobe Illustrator makes it simple to make a variety of graphics for a variety of purposes- you can even work off a base photo image if you aren’t comfortable with freehand. Having the skills to transform ideas into icons and images puts you ahead of the game in the working world. You can lend your expertise to website work, brochures, book publishing, and much more! In the digital design world, there are two basic types of images- raster and vector. The former type is the one most common in photographs and other shared media; these include your familiar jpg, gif, and tiff files. These are all comprised of a grid of pixels, and can lose quality easily when edited and resized, and for this reason they are not generally used in the professional biz realm. Vector images, however, are not made of pixels, but rather relationships between points and the shapes between them. This means that vectors can be resized a thousand times and still be perfect and sharp- ideal for any kind of print media and business logo and promotional work. If you are comfortable creating these, you can bring your savvy to the salary negotiation table! Everyone knows that to be successful, you have to advertise. Goods and services form the foundation of our economy, and the competition to take the corner on the market is fierce. Businesses are constantly seeking new and fresh ways to spread their brand message and boost revenue, and having employees well versed in Illustrator is well worth their money. With graphic design abilities, you’ll be able to easily create everything from product mockups, sale/promo images, flyers/brochures, and print media for distribution. The more ways you can think of to pitch a product or idea, the more valuable you’ll be- no professional advertising background needed. If you are ready to take the next step to further your career goals, consider signing up for one of our Adobe Illustrator classes! Fill out the form below to request more information about 5 Ways To Boost Your Resume With Adobe Illustrator or to request information on customized individual or group training sessions.